Kyle Gendron is expected to lead the Panthers pitching staff after producing a stellar junior season (File Photo). 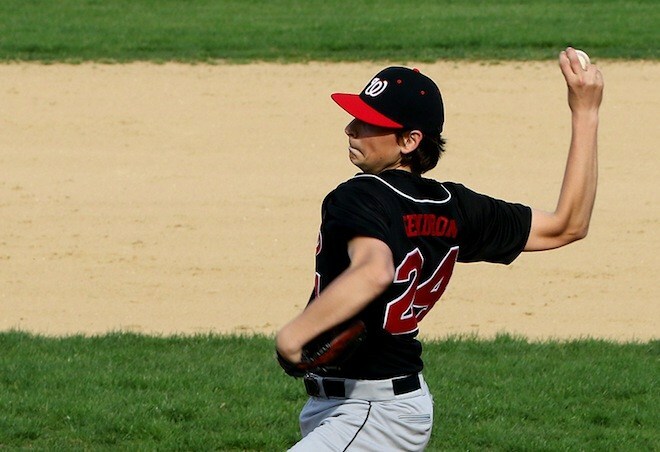 Led by workhorse Kyle Gendron and the Peterson brothers, the Wilmot Union High School baseball team looks to stay focused in the highly competitive Southern Lakes Conference, which includes WIAA Division 1 state qualifier Burlington. Panthers coach Josh Pye, however, indicates the team needs to shore up its defense following the departure of graduated seniors Troy Hickey and Josh Schattner. Hickey, a left-hander, plays for Madison College while Schattner pitches at Winona State University. While Gendron looks to log most of the innings, Pye will make adjustments to the lineup, depending on who else is on the mound for the Panthers. Gendron, an SLC first team honoree and honorable mention all-state as a junior, is poised to have a productive senior season. As a junior, Gendron showed command of his pitches, issuing just 16 walks compared to 46 strikeouts and compiling a 6-1 record with a 1.16 ERA. Gendron, a Division II Winona State University commit, also contributed on offense with 12 hits, including four doubles. The Peterson brothers, meanwhile, look to offer Gendron run support at the plate, where both Gunner and Tanner garnered first team all-conference honors last season. Gunner, who garnered second team all-state honors as a junior last year, pounded out 31 hits, collected nine doubles, four triples and belted two of the team’s three home runs. He also had 16 RBIs and batted a robust .449 with a .542 OBP while primarily playing outfield. On the mound, Gunner struck out 27 hitters and walked six through 24 innings, where he accrued a meager 0.88 ERA and finished 3-1. For Tanner, a junior infielder/outfielder, he tallied 23 hits, including six doubles, and batted .338 with a .416 OBP. The Petersons both plan to attend Illinois State University. Another returner is second team outfielder/pitcher A.J. Frisby, who knocked in 16 runs and batted .321 with a .420 OBP. Senior shortstop Justin Paasch is another returner. Paasch, during last year’s honorable mention all-SLC campaign, showed plate discipline, drawing 15 walks to just four strikeouts to accumulate a .452 OBP with 19 runs scored. Cameron Wischnowski, an outfielder, returns for his senior season following a year where he had a team-leading seven stolen bases. Other returners include Evan Henry (junior, catcher), Jacob Gerzel (senior, outfielder), Jarrett Lipstreuer (senior) and Zach Lamberson (junior, infielder). Meanwhile, new to the team are Leo Falletti (freshman), Logan Pye (sophomore), Caden Mulhollon (freshman), Bodie Stickels (junior) and Josh VanKampen (junior). As the Panthers look toward the season, Pye acknowledged his team needs to play consistently to succeed in the SLC. “Competing in the SLC means you have to come ready to play every night. You can’t afford to have an off night because a single game can make a difference in a 14-game conference schedule,” Pye said.